Bible Answers: Is Christianity For Real? - Publisher Doesn't Christianity stifle personal freedom? Isn't it just a crutch for the weak? Don't people become Christians through social conditioning? Aren't Christians irrelevant to modern life? Aren't all religions basically the same? These common questions deserve answers - because they address the most important issues of life. This helpful book explores several popular myths about Christianity and concludes that there are good reasons to accept Jesus' teachings - both for now and for eternity. - Publisher Is Christianity for Real? uses logical and biblical arguments to prove that Christianity is true. By M. Green and G. Carkner. About "Bible Answers: Is Christianity For Real?" Doesn't Christianity stifle personal freedom? Isn't it just a crutch for the weak? Don't people become Christians through social conditioning? Aren't Christians irrelevant to modern life? Aren't all religions basically the same? These common questions deserve answers - because they address the most important issues of life. 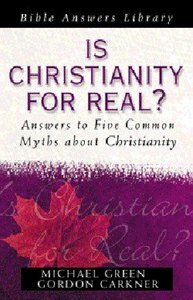 This helpful book explores several popular myths about Christianity and concludes that there are good reasons to accept Jesus' teachings - both for now and for eternity. Is Christianity for Real? uses logical and biblical arguments to prove that Christianity is true. By M. Green and G. Carkner. Michael Green is chaplain for the Oxford Centre for Christian Apologetics, and also teaches the evangelism module there. In addition, he is director of the Good News Initiative of the Anglican Communion Network in the United States. He formerly served as senior research fellow at Wycliffe Hall, Oxford University, England, and as adviser in evangelism to the archbishops of Canterbury and York. As a pastor, evangelist, author and lecturer, he has taught and preached the New Testament for many years. His many books include I Believe in the Holy Spirit and Evangelism in the Early Church.